Formerly the Danish West Indies, they were sold to the United States by Denmark in the Treaty of the Danish West Indies of 1916. 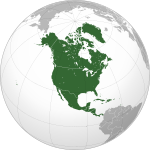 They are classified by the UN as a Non-Self-Governing Territory, and are currently an organized, unincorporated United States territory. The U.S. Virgin Islands are organized under the 1954 Revised Organic Act of the Virgin Islands and have since held five constitutional conventions. The last and only proposed Constitution, adopted by the Fifth Constitutional Convention in 2009, was rejected by the U.S. Congress in 2010, which urged the convention to reconvene to address the concerns Congress and the Obama Administration had with the proposed document. The convention reconvened in October 2012 to address these concerns, but was unable to produce a revised Constitution before its October 31 deadline. Hurricane Hugo struck the Virgin Islands in 1989, causing catastrophic physical and economic damage. The territory was again struck by Hurricane Marilyn in 1995, killing eight people and causing more than $2 billion in damage. The islands were again struck by Hurricane Bertha, Hurricane Georges, Hurricane Lenny and Hurricane Omar in 1996, 1998, 1999 and 2008, respectively, but damage was not as severe in those storms. The U.S. Virgin Islands are an organized, unincorporated United States territory. Even though they are U.S. citizens, U.S. Virgin Islands residents cannot vote in presidential elections. U.S. Virgin Islands residents, however, are able to vote in presidential primary elections for delegates to the Democratic National Convention and the Republican National Convention. Unlike persons born on the mainland and naturalized citizens who derive their citizenship from the Fourteenth Amendment of the U.S. constitution, those born in the U.S. Virgin Islands derive their U.S. citizenship from Congressional statute.
. However, the elected delegate, while able to vote in committee, cannot participate in floor votes. The current House of Representatives delegate is Donna Christensen (D). On Oct 21, 1976, President Gerald Ford signed Pub.L. 94-584 authorizing the people of the United States Virgin Islands to organize a government pursuant to a constitution, which would be automatically approved if Congress did not act within 60 days. On May 26, 2009 the U.S. Virgin Islands Fifth Constitutional Convention adopted a proposed a Constitution of the Virgin Islands, which was submitted by President Barack Obama to Congress on March 1, 2010. On June 30, 2010, President Obama signed Pub.L. 111-194 in which Congress urged the constitutional convention to reconvene. Months later, a federal lawsuit was filed in the Federal District Court of the Virgin Islands in 2011. The lawsuit claimed that the United States had to provide U.S. Virgin Islanders with the ability to be represented in Congress and vote for U.S. President. The case is Civil No. 3:11-cv-110, Charles v. U.S. Federal Elections Commission et. al (3:11-cv-00110-AET-RM). It alleged that racial discrimination present in an all-white and segregated U.S. Congress of 1917 was the impetus to deny the right to vote to a majority non-white constituency. The case was ultimately dismissed and closed on August 16, 2012 by District Judge Anne E. Thompson from the Federal District Court of the Virgin Islands, Division of St. Croix. As in most Caribbean countries, Christianity is the dominant religion in the U.S. Virgin Islands. Protestantism is most prevalent, reflecting the territory's Danish colonial heritage. There is also a strong Roman Catholic presence. As in other Caribbean islands, Rastafari is also prevalent. There are some Jews living in the territory, and a significant Muslim population, primarily of Palestinian descent. St. John Sun Times, online resource. ^ a b c "CIA - The World Factbook-US Virgin Islands". https://www.cia.gov/library/publications/the-world-factbook/geos/vq.html. Retrieved March 25, 2012. ^ Slawych, Diane. "Love is in the air". CANOE.ca. http://travel.canoe.ca/Travel/Activities/Romantic/2004/02/11/343943.html. Retrieved January 25, 2008. ^ "Average Conditions Saint Thomas, VI". weather.com. http://www.weather.com/outlook/travel/businesstraveler/wxclimatology/monthly/00801. Retrieved May 16, 2010. ^ "St John Map of Quarters and Estates | US Virgin Islands Real Estate". Holiday Homes of St. John. http://holidayhomesvi.com/resources/area-descriptions/. Retrieved December 21, 2015. 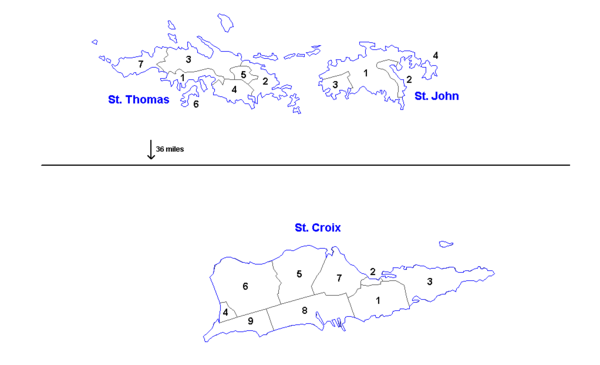 ^ "American Virgin Islands Maps - Map of St. Croix Condos". American-virgin-islands.com. 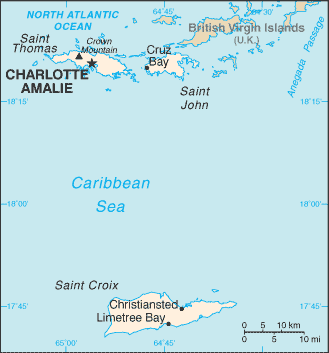 http://www.american-virgin-islands.com/islandmaps.html. Retrieved December 13, 2012. ^ Office of the White House Press Secretary (June 30, 2010). "Statement by the Press Secretary on S.J.Res. 33". http://www.whitehouse.gov/the-press-office/statement-press-secretary-sjres-33. Retrieved June 30, 2010. ^ "USVI Constitutional Convention mandated to reconsider autonomous proposals". Virgin Islands News Online. June 30, 2010. http://www.virginislandsnewsonline.com/news/usvi-constitutional-convention-mandated-reconsider-autonomous-proposals. ^ by Andrew (February 19, 2012). "USVI, NREL Partner to Reduce Fossil FuelS 60% by 2025". CleanTechnica. http://cleantechnica.com/2012/02/19/us-virgin-islands-launches-15-year-energy-initiative-to-reduce-fossil-fuel-use-60/. Retrieved December 13, 2012. ^ "U.S. Virgin Islands Water and Power Authority (WAPA)". Viwapa.vi. http://www.viwapa.vi. Retrieved December 13, 2012. ^ By DANIEL SHEA (Daily News Staff) (January 19, 2012). "HOVENSA closing - News". Virgin Islands Daily News. http://virginislandsdailynews.com/news/hovensa-closing-1.1259790#axzz1nXpo7wFr. Retrieved December 13, 2012. ^ "Census 2010 News | U.S. Census Bureau Releases 2010 Census Population Counts for the U.S. Virgin Islands". 2010.census.gov. http://2010.census.gov/news/releases/operations/cb11-cn180.html. Retrieved December 13, 2012. ^ "Census 2010 News | U.S. Census Bureau Releases 2010 Census Ethnic Counts for the U.S. Virgin Islands". 2010.census.gov. http://stthomassource.com/content/news/local-news/2013/02/05/us-census-shows-vi-aging-growing-more-hispanic. Retrieved March 23, 2013. ^ "Chabad Lubavitch Jewish Center of the Virgin Islands - Your Soul Resort In America's paradise". Jewishvirginislands.com. http://www.jewishvirginislands.com/. Retrieved December 13, 2012. ^ a b "Virgin Islands Tourist Tips". Here.VI Search. WebMastersVI.com. http://www.here.vi/Tourist_Tips/tourist_tips.html. Retrieved January 24, 2010. ^ "Official USPS Abbreviations". United States Postal Service. http://www.usps.com/ncsc/lookups/usps_abbreviations.html. Retrieved January 24, 2010. ^ a b "Virgin Islands General Information". United States Postal Service. http://www.usps.com/ncsc/addressstds/vigeninfo.htm. Retrieved January 24, 2010. ^ "St Thomas, VI". Zip-Codes.com. Datasheer, LLC. http://www.zip-codes.com/city/VI-ST-THOMAS.asp. Retrieved January 24, 2010. ^ "Christiansted, VI". Zip-Codes.com. Datasheer, LLC. http://www.zip-codes.com/city/VI-CHRISTIANSTED.asp. Retrieved January 24, 2010. ^ "St John, VI". Zip-Codes.com. Datasheer, LLC. http://www.zip-codes.com/city/VI-ST-JOHN.asp. Retrieved January 24, 2010. ^ "Frederiksted, VI". Zip-Codes.com. Datasheer, LLC. http://www.zip-codes.com/city/VI-FREDERIKSTED.asp. Retrieved January 24, 2010. ^ "Kingshill, VI". Zip-Codes.com. Datasheer, LLC. http://www.zip-codes.com/city/VI-KINGSHILL.asp. Retrieved January 24, 2010. ^ "Virgin Islands Daily News | virginislandsdailynews.com | A Pulitzer Prize Winning Newspaper, Virgin Islands Guide, Virgin Islands InfoVirgin Islands Daily News". Dailynews.vi. http://www.dailynews.vi/. Retrieved December 13, 2012. ^ "Welcome to the Frontpage". Stjohntradewindsnews.com. http://www.stjohntradewindsnews.com/. Retrieved December 13, 2012. ^ "St. John Sun Times". St. John Sun Times. http://www.stjohnsuntimes.com/. Retrieved 2014-01-21. ^ "St John On Island Times". St John On Island Times. http://www.onislandtimes.com/. Retrieved 2014-01-21. This page uses content from the English language Wikipedia. The original content was at United States Virgin Islands. The list of authors can be seen in the page history. As with this Familypedia wiki, the content of Wikipedia is available under the Creative Commons License.